If the world is watching, as the hype assures us, then the world had better get ready for a piece of footballing theatre that wouldn't be out of place as some kind of warm-up act for the Jim Rose Circus. Rangers v Celtic (or Celtic v Rangers as one incensed character on Twitter demanded it be called, among other things) is a show, no doubt about it. At times, it can be a production that you end up watching between the cracks in your fingers - painful to witness but compelling all the same. It's not necessarily the football that draws people in - too often the stuff that happens on the pitch is a 100mph demolition derby. It's the whole bizarre scene that lends this affair its appeal. Look one way and you could be at Wembley in 1966 with all the Union flags waving. Look the other, with all the Tricolours, and you could be at Croke Park on All-Ireland hurling final day. One thing you will struggle to see is a flag of the nation from which these teams hail. So many symbols of identity and yet barely a Saltire to be seen. The hope for Sunday is for unpolluted airwaves, untroubled streets - and on-field drama. The last time these sides met, the occasion fell in a heap. It got the big build-up back then as well - the League Cup semi-final of last February - but it was a non-event. Rangers were still a basket case, a wounded and almost pitiful animal. The people who ran the club could not have been any more unpopular with the fans had they gone about Glasgow in Celtic strips while singing Paddy McGinty's Goat. They had a caretaker manager, Kenny McDowall, who took to the role like a rabbit takes to oncoming traffic. They had a team whose collective heart could have been comfortably placed inside a peapod. Before they played Celtic, they had already lost to Hibernian (twice), Hearts (twice), Alloa Athletic and Queen of the South on a cumulative score of 16-4. Immediately after their 2-0 defeat by Celtic, they won just one of their next six games in a doomed Championship campaign that was brought to an ignominious end when they got hammered 6-1 on aggregate in the play-off final against Motherwell. That was then, but it's different now. Rangers' landscape is no longer blurred. They have a new team, a new manager, a new board and an infinitely brighter outlook on life. They're champions of their league and now they have a shot at the reigning champions of the Premiership. The only pressure on Rangers is to be competitive, to rattle Celtic's cage and give them a scare. If that brings them a victory then that's a seismic day out, but there's not a great burden of expectation on Mark Warburton's team. They had one task to perform this season - getting out of the Championship - and they've done it well. Anything else is a cherry on top. Rangers have an in-built rationale for defeat, if it comes. Everybody at Ibrox knows that the team that won the Championship is not going to be the same team that compete next season for the Premiership. They need to strengthen. Warburton has made no secret of it. In Hearts' story, we can see the proof that a landslide winning of the Championship doesn't equip you for life in the top tier. Robbie Nielson took a scalpel to his title-winning team of 2014-15. He has signed nearly a dozen players since lifting the trophy. He has let players who performed admirably for him last season leave the club because he knew he needed better. That's the road Warburton is surely going to go down now. If Rangers lose, you can already hear Warburton's reaction: "We weren't ready today, but we will be come August." It's different for Celtic. Everybody expects them to win. Manager Ronny Deila's job might well depend on it. There is no parachute, no safety net. That's pressure. And pressure is something that has troubled them at Hampden in the recent past. In their last two visits there - the Scottish Cup semi-final last season and the League Cup semi-final this campaign - they have lost an early lead, lost a man to a red card and lost the match, against Inverness Caledonian Thistle and Ross County. Celtic's mindset can be frail. Not always, but on certain days. Perhaps the losing of leads and the dropping of points in European games against Ajax and Fenerbahce is understandable, but doing the same against Kilmarnock, Aberdeen, Motherwell, Hearts and Hamilton Accies raises doubts. When you add in their inability to deal with Inverness and Ross County then there is a vulnerability that could be exploited if the stars are aligned for Rangers. Rangers have not come up against a striker of Leigh Griffiths' quality this season. Not even close. Griffiths has scored against every opponent in the Premiership and ended his three-match 'drought' with the two goals that beat the country's form team, Motherwell, last weekend. That brought his total for the season to 37. In Martyn Waghorn's likely absence, Kenny Miller is Rangers' top scorer with 17, but 13 of those came against sides outside of the top-four in the Championship. That's the unknown with Rangers. They have, in Andy Halliday, Jason Holt, James Tavernier and Lee Wallace, players who have scored a combined 40 goals this season, but what value would you put on those goals in the context of this semi-final? Most were against substandard Championship teams. Can they do it against the best in Scotland? James Keatings was Hearts' second-top scorer in the Championship last season and they let him go. Billy King, now at Rangers on loan, scored eight from midfield and was allowed to exit in the short-term. Genero Zeefuik was the size of a house, but he still scored 12 times in 13 starts in Hearts' Championship-winning campaign. Scoring freely in the second tier is one thing. Doing similar against the top of the top tier is an altogether different proposition. Griffiths is one of the keys to this match because he operates in the precise area where Rangers are at their weakest. Rangers are available at odd of almost 3-1 with the bookmakers for a reason. They have already conceded 27 goals in the Championship this season and they still have four games to play. Hearts conceded a total of 26 in that division last season. In the Premiership, Celtic have conceded 25. Hibs (twice), Falkirk (twice), Queen of the South and Raith Rovers have all scored two or more in league games against Rangers. Rovers scored three in one match, Queen of the South have scored five in four games against Warburton's side, Falkirk have got six in four. Bring Hearts back into the debate. Only 26 goals conceded in the entire Championship last season, but they strengthened at the back in the summer none the less. Blazej Augustyn and Igor Rossi - solid defenders both - were signed and yet still Celtic have scored seven times in four games against Hearts this season. Danny Wilson and Rob Kiernan lack pace and could be easy prey for Griffiths. Tavernier scores goals from full-back, but he lacks discipline as a defender. Patrick Roberts, a terrific young player with incredibly quick feet, plays on the right wing for Celtic, but it wouldn't be a surprise to see him pop up on the left at times in an attempt to expose Tavernier's defensive shortcomings. 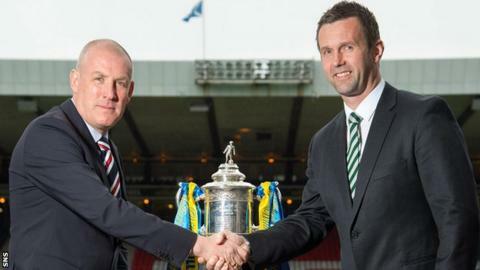 The question is: can Rangers hold Celtic out? Do they have the concentration and discipline to defend properly against Griffiths and Roberts, in particular? Do they have the steel in the middle of the park to contend with Scott Brown and Nir Bitton? They might argue that there is an encouraging form-line. In three recent cup ties with Premiership opposition - Kilmarnock (twice) and Dundee - Rangers only conceded one goal while scoring six. Kilmarnock are, currently, the 11th best team in the Premiership and Dundee are the seventh. Celtic are clearly first, but Rangers people will point out that Dundee held Celtic scoreless twice in recent months and Killie denied them for 90 minutes until Tom Rogic rescued his team with a thumping hit from a mile out. It can be done, no question. Celtic are going to win the Premiership title, but they have put in a string of poor performances along the way. Griffiths has been like a human sticking plaster at times, holding the whole thing together. If Rangers bring defensive stability, fire in the midfield and ruthlessness up front then they can scare Celtic, but that's a lot to ask. Their job would be made easier, of course, if Deila's team press the self-destruct button again at Hampden. Celtic deserve to be warm favourites - and, in quality terms, should win by a couple of goals - but given the recent evidence, you cannot discount another mental implosion. It depends which version of themselves they bring to Hampden on Sunday. They hold most of the aces, but they carry all of the pressure too.